Golf fans will be viewing the Masters Golf tournaments by sitting at the edge of their seats. Non-golf-fans will be surprised how much excitement this seemingly peaceful game packs. 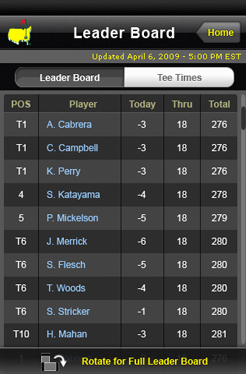 One aspect of this year’s tournament that will keep everyone engaged is Tiger Woods’ performance. Golf fans will be curious to see how his recent personal problems affect his game. 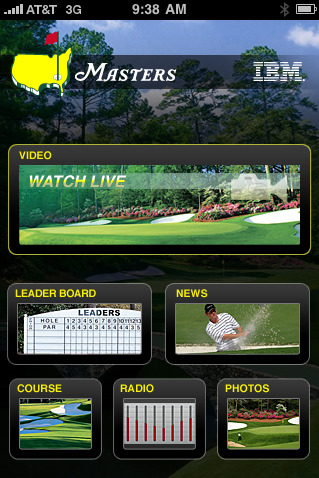 Apple device owners need not glue themselves to a television or to a computer screen in order to stay updated with the Masters Gold tournament this year because of a great application of the same name – the Masters Gold Tournament application. This sports coverage application is compatible not only on the iPod and iPhone, but also on the iPad. iPhone OS 3.0 (or greater) is the software requirement for the application to run properly. The application is not a simple sports coverage application but shows videos, leader boards, news, courses, and photos of the tournament. 1. Live video from the Masters Tournament; this exclusive coverage includes Amen Corner (hole numbers 11, 12, and 13), hole numbers 15 and 16, and Masters Extra (bonus one-hour pre-telecast coverage). 2. New Featured Group coverage debuts in 2010. 3. On Demand Video Highlights will be available at the end of each day. 4. All video will be viewable with Edge, 3G, and Wifi connections. Golf fans who own an Apple device will surely appreciate this application which can be gotten for free from here.